Nonfederal organizations in industries such as manufacturing, aerospace, defense, and machinery that work with government agencies/contractors and handle controlled unclassified information (CUI) needed to be compliant with the requirements laid out in NIST Special Publication 800-171 by December 31, 2017. Don't risk your government contracts. It's not too late to become compliant and protect your business. Find out how below. What Is NIST Special Publication 800-171? NIST 800-171 refers to National Institute of Standards and Technology Special Publication 800-171, which governs controlled unclassified information (CUI) in nonfederal information systems and organizations. It is essentially a set of standards that define how to safeguard and distribute material deemed sensitive but not classified. 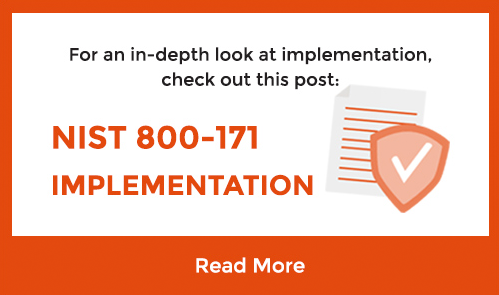 NIST 800-171 was developed after FISMA (Federal Information Security Management Act) was passed in 2003, resulting in several security standards and guidelines. It was created in part to improve cybersecurity, especially after numerous well-documented breaches in the last few years. 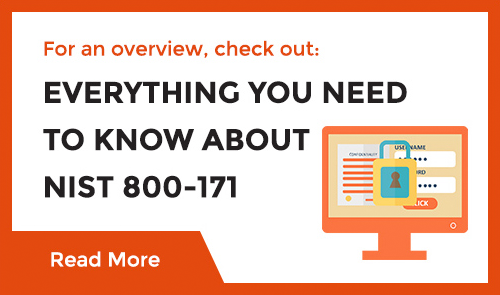 How Do I Know If My Business Is Affected By NIST 800-171 Guidelines? Entities that have contractual relationships with state agencies are now required to comply with NIST 800-171. Subcontractors that don’t work directly with state agencies must comply because they do so indirectly. Failure to implement these requirements could result in the loss of work and potentially a severance of contracts with these state departments. Not sure whether or not that you're affected by this? Take our NIST 800-171 Self-Assessment Quiz to get an idea in less than a minute. What kind of training is still needed for managers, employees, and clients? How to continue to be compliant? The deadline has passed which may leave your government contacts (and data) at risk but there's still time to become compliant and protect your business. But don't be complacent, it can take months to become fully compliant - not to mention providing your partners and contractors peace of mind knowing that their information is safe with you. Speak with an expert from the Kelser team to get your business on the path to compliance today.